Neidhard-Minges Funeral Home is one of the oldest and most respected funeral homes in the Western Hills area and has been privileged to serve its many residents. Our reputation for honesty, fairness and a true concern for those we serve has been a hallmark of Neidhard-Minges for over 150 years. Our roots date back to 1860, approximately one year before the start of the Civil War. Operated under the name "A. Neidhard & Sons", the funeral home was located at the site of the Neidhard family residence in Taylor's Creek. Andrew Neidhard (pictured at right) settled on Harrison Pike in Taylor Creek in 1859. He owned a wagon repair business and began making coffins and transporting the dead. In March of 1860, he finally decided to hang out his shingle which said "Andrew Neidhard: Undertaker, Coffins Made to Order." When called upon, Andrew would measure the deceased with a piece of string and then make a solid walnut coffin at the standard price of $15.00! He would then transport the deceased on a spring wagon trimmed with draperies to give it the appearance of a hearse. This method continued until about 1875 when Andrew purchased a horse drawn hearse, one of the first modern funeral vehicles of that era. In an attempt to solve the problem of preservation of the deceased and to allow more time for family and friends to pay their respects, Andrew built large ice boxes on the premises which helped preserve the body for longer periods of time. He was assisted in the trade by his sons William, Charles, George and Edward. In 1908, the business was sold to Andrew's son Edward "E.J." Neidhard. E.J. (pictured at right) began his career at the age of 12 working for his father in the livery, where he fed and curried the horses. When he was 17, he drove the carriage in which President Benjamin Harrison journeyed from Cleves to North Bend, Ohio in 1892, for the burial of his sister in the Harrison Tomb. At the age of 20, E.J. began attending embalming lectures by circuit-riding professors and enrolled in several local Colleges and Training Schools. In 1902 he became one of the first licensed embalmers in the State of Ohio. E.J. was a crusader for Western Hamilton County improvements; he successfully petitioned for free rural mail delivery in 1903, persuaded the Cincinnati & Harrison Pike Co. to have telephone lines extended from Cheviot to Miamitown, and collected money to run electrical service between Miamitown and Taylor's Creek. In 1915, E.J. purchased the first motorized hearse in Western Hamilton County. E.J. married on Sept. 5, 1900 to the former Catherine Anstedt of Shandon. They had four children, Joseph, Raymond, Marie & Lucille. In 1923, the business was expanded to Mt. Healthy, Ohio where oldest son Joseph was placed in charge. 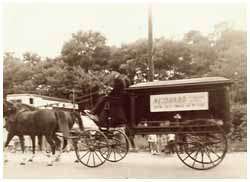 In 1928, a third funeral home was opened in Westwood; it was operated by E.J. and his younger son Raymond, who helped his Dad in the business until his death in 1954. E.J. 's daughter Marie married Henry Minges; in 1947, their oldest son, James, began working in the business after serving his country in WWII. Jim is the fourth generation of the Neidhard family. His wife, the former Mary Donnelly, is also a licensed funeral director. She has been active in the business in a multitude of capacities and presently helps with the management of the Harrison Ohio location. Jim purchased the business from his grandfather E.J., who died suddenly in February of 1960, just one month before the centennial celebration of the funeral home. knothole baseball team Jim continued with the longstanding Neidhard tradition of knothole baseball team sponsorships and oversaw the remodeling of both the Taylor's Creek and Westwood locations in the 1960's. It was during this time that the "Minges" name was added to the business. In 1979, the fifth generation of the Neidhard-Minges family, Mark Minges, joined the firm as a licensed funeral director and embalmer, followed in 1984 by brother Pete. 1986 saw the expansion of the firm into the Harrison, Ohio area with a new location at the corner of New Haven Rd. and Carolina Trace. This location was managed by Jim until his death in 2006. All three locations are now managed by Mark & Pete. The future looks bright for the continuation of the families tradition in funeral service. Mark and Pete have six children between them and are looking forward to the sixth generation of Neidhard descendents to someday operate the family business.